From slicing a pork loin to dicing a pineapple, knowing how to work with knives is critical to success in the kitchen. From slicing a pork loin to dicing a pineapple, knowing how to work with knives is critical to success in the kitchen. Equipping yourself with the proper knives is key, says Brendan McDermott, chef-instructor and resident knife skills expert at New York's Institute of Culinary Education. If you're equipping your first kitchen, thinking of giving a great set of knives as a wedding or holiday gift, or staring down a brawny butternut squash on your countertop, you'll want to know which knives are a cook's best friend. Read on to discover the four essential knives every home cook should own, plus how to use them, how not to use them, and what price point yields the best-quality blade. How to Use It: A classic chef's knife is the most important knife in your collection. Brendan McDermott recommends an 8- to 10-inch chef's knife, which he acknowledges may be slightly longer than most people are comfortable with at first. However, the longer edge makes the knife more versatile and efficient. "The more blade you have, the more knife you have to do the work for you," he explains. "And the bigger the blade you have to slice through an ingredient, the safer it is." A chef's knife is the go-to tool for more than 90 percent of daily kitchen tasks, McDermott notes, including a most slicing and dicing of fruits, vegetables, meats, and fish. How Not to Use It: While a chef's knife may be the "king of the kitchen," it should not be used to butcher or carve poultry, to remove the skin of large vegetables such as butternut squash, or, as some people have tried, to puncture a hole in cans. The broadness of a chef's knife blade makes it unwieldy for tasks better suited to a smaller knife. Price: Of all the knives you own, McDermott recommends spending the most on your chef's knife and suggests a price of about $100 for a high-quality chef's knife. "Remember that knives are heirlooms," he says. "And the good ones should last forever." How to Use It: A paring knife picks up where a chef's knife leaves off. It's best for slicing and mincing items that are too small for an 8- to 10-inch blade, such as garlic, shallots, or strawberries. "Because the average paring knife blade is about 3 1/2 inches long, it's a great tool for any foods that require an attention to detail," McDermott says. How Not to Use It: Avoid using paring knives to cut very hard vegetables, such as carrots, celery root, or parsnips. These smaller knives don't carry enough weight to easily slice through the foods, which may prompt you to increase the pressure or tighten your grip as you're cutting. "If you find yourself applying pressure at any point, you're doing something wrong," McDermott counsels. Forcing the cut is a signal that you aren't using the right blade for the job, and it can be dangerous, too, causing the knife to slip. Price: McDermott recommends spending about $20 for a good-quality paring knife. Steer clear of ceramic knives and opt for a metal blade for a longer lifespan. How to Use It: Serrated knives may be most commonly associated with slicing bread, which is why they are also called bread knives. But according to McDermott, the toothed blade can take on almost any job not suited to the straight blade of a chef's knife. A serrated knife, with an average blade length of 6 inches, is especially useful for foods with waxy surfaces, such as tomatoes, pineapples, watermelons, citrus, and peppers. The jagged edge can grip and penetrate those slippery exteriors, while the flat blade of a chef's knife would slip and slide across the surface. Bottom line: Think beyond bread. 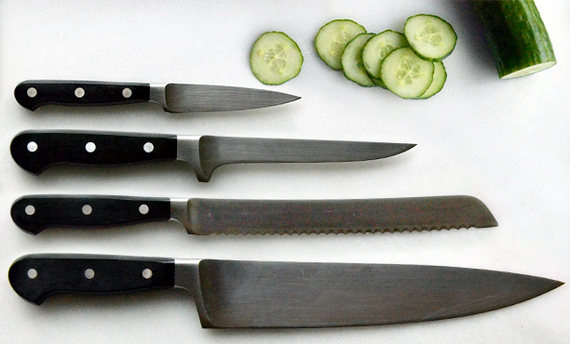 How Not to Use It: Serrated knives should only be used for slicing, rather than chopping, foods. Using a sawing motion with the knife allows the teeth along the blade to grip and cut through ingredients, which is also why a serrated knife should not be used to slice smaller items such as fresh herbs, garlic, or berries. Price: McDermott recommends spending $30 to $40 for a good-quality serrated knife. If you take good care of your serrated knife, it will stay sharp for years to come, says McDermott. And if your knife gets dull, McDermott recommends simply replacing it. How to Use It: As its name implies, a boning knife is the best blade for cutting up or boning fish, meat, or poultry of any size, whether a 3-inch-long anchovy or a 150-pound side of pork. "Most knives are designed to cut straight lines," McDermott says. "But when it comes to anything with a ribcage and joints, there is no such thing as a straight line in the body, so you need a blade that can move and flex." A boning knife gives you that leeway. How Not to Use It: A boning knife should not be used to cut through bones, but rather to cut around bones. The knife functions similarly to a jigsaw, providing the flexibility to deftly separate meat from bone as well as slice through joints and cartilage. Price: McDermott recommends spending about $30 for a good-quality boning knife and suggests investing a bit more if a boning knife will get heavy use in your kitchen. How to Use It: The fifth essential tool for your knife block is actually not a knife at all but rather a honing steel, which is designed to keep your knives at their peak sharpness for as long as possible. "A honing steel is likely the second most important tool in the kitchen after a chef's knife," McDermott says. Running your knife along a steel realigns the teeth (or fibers) on the blade, which leads to a sharper edge and thus a cleaner cut. Knives should be honed every time you use them, but because honing doesn't actually sharpen the blade, McDermott suggests home cooks have their knives professionally sharpened once a year. How Not to Use It: A honing steel can be used with any straight-sided blade, such as a chef's knife or paring knife, but it should not be used on serrated knives since the teeth won't glide along the steel. Price: A honing steel is often included when knives are purchased as sets; however, they can also be purchased individually. In that case, McDermott recommends either a ceramic or steel model that costs about $25.